 In Syria, the delivery of humanitarian assistance to several locations continued to be hampered due to ongoing or renewed hostilities. 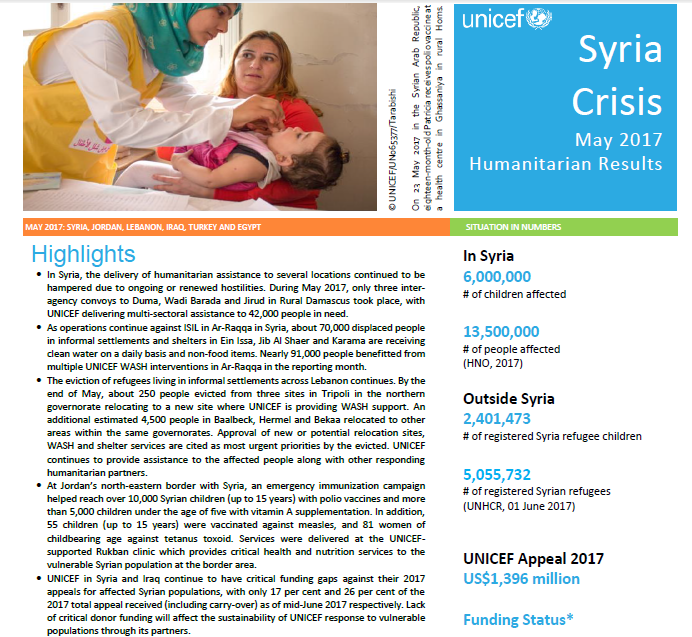 During May 2017, only three inter-agency convoys to Duma, Wadi Barada and Jirud in Rural Damascus took place, with UNICEF delivering multi-sectoral assistance to 42,000 people in need.  As operations continue against ISIL in Ar-Raqqa in Syria, about 70,000 displaced people in informal settlements and shelters in Ein Issa, Jib Al Shaer and Karama are receiving clean water on a daily basis and non-food items. Nearly 91,000 people benefitted from multiple UNICEF WASH interventions in Ar-Raqqa in the reporting month.